~* West End Designs Journal *~: Lucy Speaks Out! Hi Everyone, Miss Lucy here! Please click on my picture and go see my mother's latest creative project and a book review. Please. Before she dresses me up again in knitwear and photographs me for more public humiliation!!! 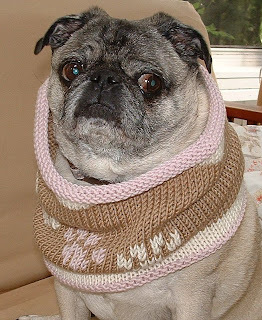 Disclaimer - No pugs were harmed in the making of the knitwear or in the taking of the photographs. Thank you.